There isn’t one state among all of the fifty states that does not have among its villages, towns, and cities, rivers, lakes, and landscapes, the name of an aboriginal nation, tribe, or renowned Native American chieft or hero. If not taken directly from tribes and chieft, the names derive from terms or descriptions of nature coined by Native Americans. Our geography is in their debt. And, after lengthy study of the 50 state flags, we noticed how Native Americans have fared in the connections we have made to the nation’s fifty state flags. To begin: two of the U.S. state flags’ designs are directly derived from known Native Americans. Some forget or don’t think of Hawaiians as Native Americans. 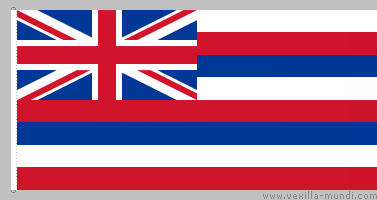 But Hawaii’s flag design came about on the orders of their native King Kamehameha I, who promoted it to recognize Great Britain as the Islands’ earliest “friend.” The flag freely adapts the English red, white, and blue stripes in the field of the banner; PLUS, it adds the British Union Jack in the canton of the complete design. The design dates from 1816 and was recommissioned and dedicated in 1845 by King Kamehameha III. Symbolically, the eight broad red, white, and blue horizontal stripes signify the eight islands comprising the nation of Hawaii, the 50th state. Of all of the state flags of the U.S., New Mexico’s is, by all criteria of design, the most striking. The state was represented by only one flag previous to this final choice. 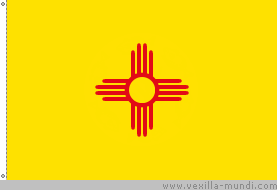 From about 1912-15, New Mexico displayed an unofficial flag at a national exposition. The parts of this design placed the U.S. flag in the canton and the New Mexico state seal at lower right. Between these were the words, in silver cloth, “New Mexico,” and completing the banner was the number “47” at upper right, indicating it as the forty-seventh state to join the Union, from January 1912. The state’s chapter of the DAR pushed for a meaningful and permanent symbol that would more genuinely reflect the coming together of all historical precedents in the region. A contest was held in 1920; Dr. Harry Mera, an archaeologist, won. He was directly influenced by the Zuni sun sign that he had found on a pottery water jar from an old Zia Pueblo ruins. In the center of the yellow field is the Zuni symbol: a pattern of four finger-like rays in the four cardinal directions from a circle (the sun) in the center. The sun sign is red. When placed on a field of bright yellow, the two colors commemorate the colors of Spain, whose explorers were the earliest to claim this territory. This beautiful flag has been flown over the state of New Mexico since 1920. The few remaining U.S. state flags designed by European-Americans that reference Native Americans do so in an official manner, not with easy to explain iconography that honorably recognizes Native Americans. 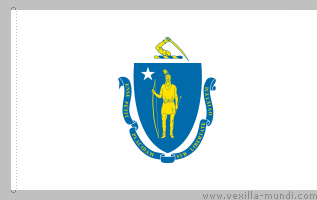 The first example is that of the flag of Massachusetts (named after Chief Massachuset of the Algonquin tribes). Chief Massachuset is depicted standing, in buckskin garb, holding a bow in his right hand parallel to his torso. In his left hand he holds an arrow with its point directed downward, signifying the intention of non-violence—peace. Completing the symbols on the blue shield pattern is a strange device showing the sturdy arm of a non-Native, bent in a threatening fashion, wielding a broad sword. This picture is placed directly above the head of Massachuset. What do we make of this? Does the symbol suggest threat? We leave it to your interpretation. 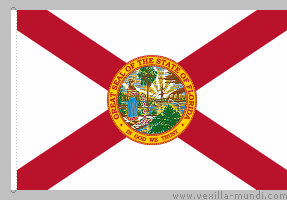 Florida’s flag incorporates their state seal in the center of their flag. We see tropical foliage and palm trees. On the background is a blazing sun symbol and a paddle-wheel steamboat. The Native American in this example is a female figure of the Seminole tribes in elaborate native dress, who is shown scattering flowers. Among viewers with no knowledge of the history of the treatment of Native Americans in the Southeast U.S., this seems a charming, peaceful scene indeed. But history should never ignore nor forget how the Seminole people were uprooted and set on their Trail of Tears when they were moved in a long overland journey to Oklahoma Territory. It is a sad fact in America’s past. Do Floridians regard this scene on their flag as symbolic of happier times? Oklahoma’s state flag is arguably one of the most significant of those with Native American derivations. From 1917 until 1941 a Choctaw warrior’s shield with symbols of peace– a peace pipe and a laurel branch– was set in the center of a color field called “Choctaw Blue,” making a very handsome emblem, for sure. 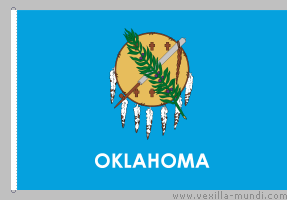 But in 1941 this flag design suffered a setback when Oklahoma lawmakers felt that few could identify the flag unless OKLAHOMA was added in large letters beneath the shield design. Can anyone take this addition as an improvement? We left commentary on Minnesota’s current flag design for last because it is our flag, and we really should give it a long second look. The design figures so very strongly with regard to the theme of Native American depiction and history. 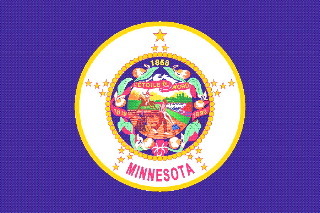 Minnesotans deserve to know how and when our flag came to have the official seal of the state. The seal was used in the center of the flag from its beginning in 1893. Its details, as a seal to mark documents, treaties, and declarations by the Minnesota state government, were very much as they still are. Native Americans faced strong prejudice from European immigrants who were settling in Minnesota and pushing westward. Native Americans were treated as wards of the state; promises made to them, signed agreements, and formal treaties were mismanaged by the white representatives of the government. So enraged had the Dakota/Sioux bands of Native Americans become that enlarging bands of renegade natives dared confrontations that led to open conflict. As these confrontations and raids increased between Native Americans and pioneers over broken promises, a family of white settlers was tortured and massacred. The year was 1862, and that act greatly influenced the whites’ fear and hatred of natives. This unfortunate event in history concluded with the capture of the guilty members, who were sentenced to be hanged in what became largest mass execution in the history of the United States. And so it is no stretch of understanding to connect this horrific incident to the attitude of the artist’s depiction of a Native American shown riding toward the setting sun in the seal design, —a plainly undisguised view of Manifest Destiny—and the inevitability of the rich Minnesota land being taken by white settlers, and the Dakota/Sioux losing their homeland. It is true that the natives were hunter-gatherers and not farmers, which the Europeans were. But to the natives it meant loss of hunting lands, fishing streams, and their sense of wide expanses of nature from which they were being driven. Of all of the 50 state’s flags with references to the original peoples here, Minnesota’s treatment, in symbolism, is the most harsh. The few Native Americans that I’ve asked to comment on Minnesota’s flag—who understand the meaning in the picture—expressed open dislike for our state’s flag. From early in the 1960s, growing recognition of the issue gave cause for change of the design of the official seal. In 1983, the path of the Native American on horse back was adjusted to convince the viewer that the Native American and his horse were now riding off to the South instead of to the West. Now, who says that OUR Minnesota flag shouldn’t be changed? *2002; Globe Pequot Press; Guilford, CT. 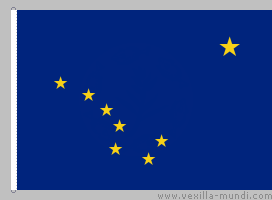 But, in the end, except for the Alaska, Hawaii, Oklahoma, and New Mexico flags discussed here, Florida and Minnesota’s flags, like two dozen others, can barely be recognized as different from one another when raised on thirty-foot poles. So any value of criticism is practically moot; details of persons, places, or things are hardly discernible anyway. Can we recognize Minnesota’s flag from the others? YES, we could, easily: Our new proposal is plainly and clearly recognizable from a great distance without a trace of bygone enmities and prejudices. Our new design serves ONLY beauty of nature and the evocation of peace. ~ by marcstratton on 26 December 2007.